Hotels should step into health as an extra service. Hotels have to reinvent themselves to stay interesting for the changing needs of today’s travelers. Your loyalty card is now a digital community with advantages that are easy to share with friends of friends. And the digital generation, the Millennials are using your in-house App to book room services or make a reservation in your restaurant. And the corporate traveler? After a long day of business meetings they will appreciate a good wellness treatment. Relaxing Massages and other Spa Wellness treatments are in the Top 3 of Most Wanted In A Hotel By The Experienced Traveler. If you do not have enough space to offer a Spa with swimming pool, jacuzzi, don’t worry. You could still offer some Spa Wellness treatments to your guests. We invited Avtar Nordine Zouareg, former Mr Universe, fitness and wellness expert, author and motivational speaker to share his vision on “why hotels should move towards more health (and profitable) services for their guests”. 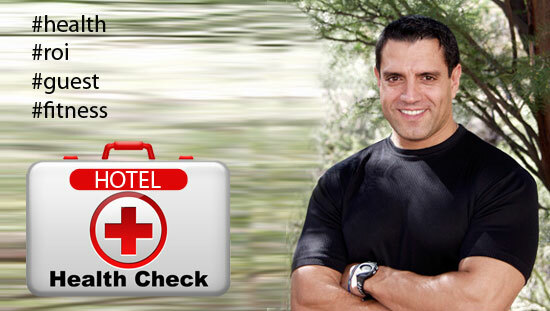 It is logical; if your guest feels fitter after a stay in your hotel, they will for sure return! John, a fifty plus corporate executive, decided that after a long day attending a corporate seminar getting a drink at the hotel bar would be a good idea. While sitting there sipping on vodka, his body reminded him of the aches and pains triggered by prolonged inactivity, “I would really enjoy a massage just about now!” he thought to himself. The problem was the hotel didn’t have a spa. Traveling over 75% of the time, the lack of sleep, poor diet and a sedentary lifestyle had driven John to desperation. His life was chaotic and his health had not been the greatest in years; overweight, overstressed and overworked, he suffered the consequences of an inactive life coupled with a demanding job. In today’s world, it’s easy for people to separate “wellness” and “success” into two separate categories. And while I believe that it is possible to be healthy without being successful… I do not believe that you can reach true success without achieving optimal wellness. Being on a vacation or on a business trip at a hotel can feel very much like fun, but this is often associated with too much drinking, eating, and insufficient sleep. This concept has left too many travelers more exhausted after their trips. Furthermore, with global stress and chronic disease on the rise — and more people on the verge of physical and emotional breakdown — what constitutes a true “vacation” and “hospitality” is now being scrutinized. So what’s happening? Preventable chronic diseases are skyrocketing. Health-focused travelers now represent 45% of the travel segment. In developed countries, nearly half the adult population is overweight. Runaway corporate healthcare costs mean half the larger businesses have adopted formal employee wellness programs, so more will seek healthier business travel. This healthy hotel trend takes many forms; the evolution of wellness-oriented hotel chains with fitness programming, spa treatments, and healthy eating is underway across so many more properties. More hotels are now branding around expanded spa and wellness offerings. Say goodbye to hotel gyms looking more like someone’s garage with a treadmill and a bench. Hotel Spa and Fitness centers are vaster, and are becoming more spectacular. What’s more, hotel guests are enjoying and engaging in wellness programs. aim to be more approachable, accessible and affordable. They’re blending fitness, a spa, healthier menus and restful sleep into meaningfully healthier stays. Everything in our lives depends on our ability to think well and take action. When we are functioning at a higher level — mentally, physically, and spiritually — good things are drawn towards us… Including more of the wealth and success that we currently enjoy. Not only does wellness provide us with the ability to perform better in our day-to-day life, it also offers us more enjoyment and more happiness in the things we do. When we live in a state of optimum wellness we feel healthy, happy, and whole. We naturally begin to control or even eliminate the little, nagging problems in our lives… Things like sleepless nights, exhaustion, excess weight or even those daily aches and pains. Owning and possessing things has begun to take a backseat to achieving optimum wellness. It’s a philosophy shared by celebrities, business magnates and soccer moms all around the world. More and more people are beginning to understand that in order to achieve true success; you must reach true health. I believe that the healthy hotel industry can help millions of travelers achieve a balanced life and has taken a path once reserved to top destination resorts and spas. Share the post "The New Healthy Hotels"